Local and regional children’s charities received a big boost with $35,000 in donations from employees of the Valero Renewables – Albion ethanol plant. Valero employees helped raise the funds through sponsorship of the 2011 Valero Texas Open and Benefit for Children Golf Classic in San Antonio, TX. 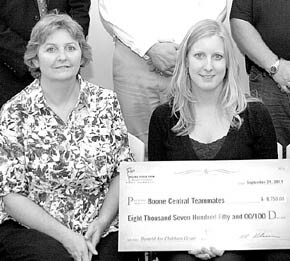 $8,750 to the Boone Central TeamMates, Albion and Petersburg.